Gave up with Video's Revenge, so thought would make an early start on this one, got all the way to worst ever Repton level (Giant Clam) and lost all my lives . Ok, just to get us started.....Edit: or not! This isn't much of a score but the task is to really learn how to solve the puzzles in a timely manner and really, really know the mazes well. As I've never played Repton before, I don't think I'm doing too bad. I'm through 2 levels now but am having issues with a couple of the puzzles in 3. For those that have played this, I'm sure this seems like a very trivial score. Wow, 3 is not easy, lost a life just because I took too long and the monster at the beginning of level 2 got me once too...sheesh but I did solve the puzzle to the key so I could finish the level. Only slightly better. I can see this game is going to be quite the struggle, figuring out the best way to complete. I still haven't completed 3 without losing 1 life, usually to time more than lack of solving. A classic Beeb game Does the first person to complete all 12 levels still get a prize...? this was easy BITD, level4 monsters a pain..
New high score, managed to finish all 12 levels , and the game just starts again, doesn't get quicker or anything, so just keep going until I lost all my lives. A few pointers - every section of earth is worth 1 point,so that can push up your score, and those monsters are a nightmare, but they do not need to be killed to finish the level (unlike Repton 2 + 3) so if you don't need to drop the egg don't. All the screens are possible to finish (Giant Clam is a nightmare - there is a way to do it but it means losing a life) always use the map to check for the best route, missed diamonds etc, there isn't one unfortunately for the last 3 levels. New high score, that will be it now I think. A tip for a couple of levels, do not get the key straight away as when the safes turn to diamonds the boulders will fall off and can block some diamonds below. Have the first 4 levels on rinse repeat with the odd mistake costing a life here and there, the monsters on E can be a real pain so getting to F with enough lives is a challenge... I recall BITD once a level was completed and the password gained the earlier levels were seldom played again so a play through from start to finish is a big challenge (for me). Definitely one of the best BBC games. Can't remember how far I got through it BITD, doubt I finished it. If Tim Tyler did this when he was 15 (IIRC) I do wonder what he's up to now!? Not sure how long it takes to finish, not that long ,no more than 45 minutes, i've been played Repton again on iRepton and then again on Android Repton , so i've been playing these levels loads in the last couple of years, they don't really take that long to do once you know the route through them. Thanks, I imagined it would be hours and thought it was an odd choice for high scores, but then just having had a quick whirl it doesn't take long (as you say) to get through each level. Once you've figured out the puzzles. Wonder if anyone does speed-running through Repton? Might be something for another round of high scores ... quickest timed runs first level Repton, Rocket Raid, whatever. But then proving it, etc. might be too hard. richardtoohey wrote: Thanks, I imagined it would be hours and thought it was an odd choice for high scores, but then just having had a quick whirl it doesn't take long (as you say) to get through each level. Once you've figured out the puzzles. 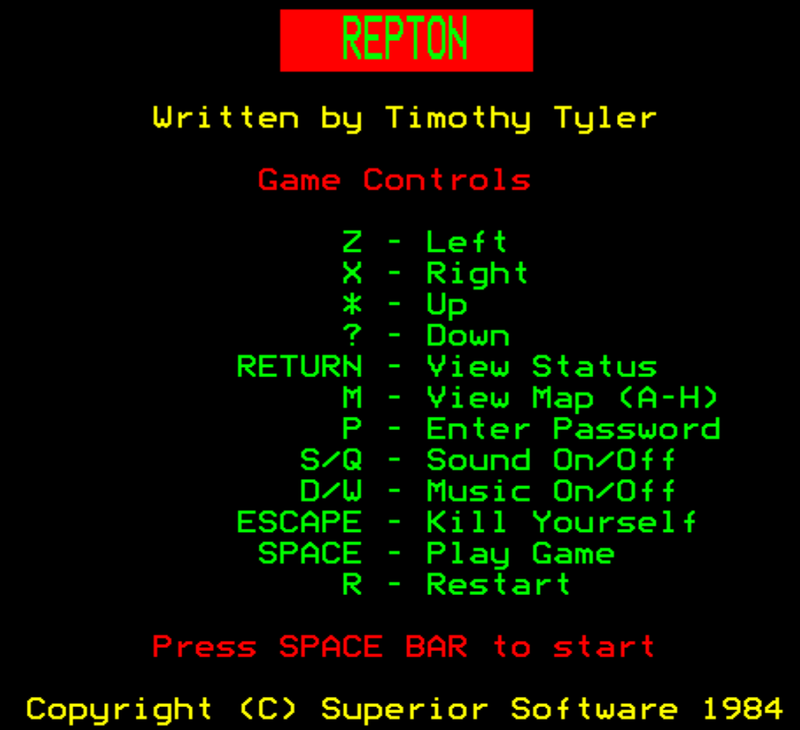 I thougth Repton was an odd choice to start with as I thought it was just complete 12 levels and the game ends, I didn't realise it would restart and you can do it again so there is no maximum score - unlike on the later incarnations of Repton1 . Some of the levels can only take a couple of minutes , you don't have to collect the earth, that takes time, depends if you want higher scores or not. Although I adore Repton I was surprised this was chosen for a high score challenge, and even more surprised at how well this competiton is going. 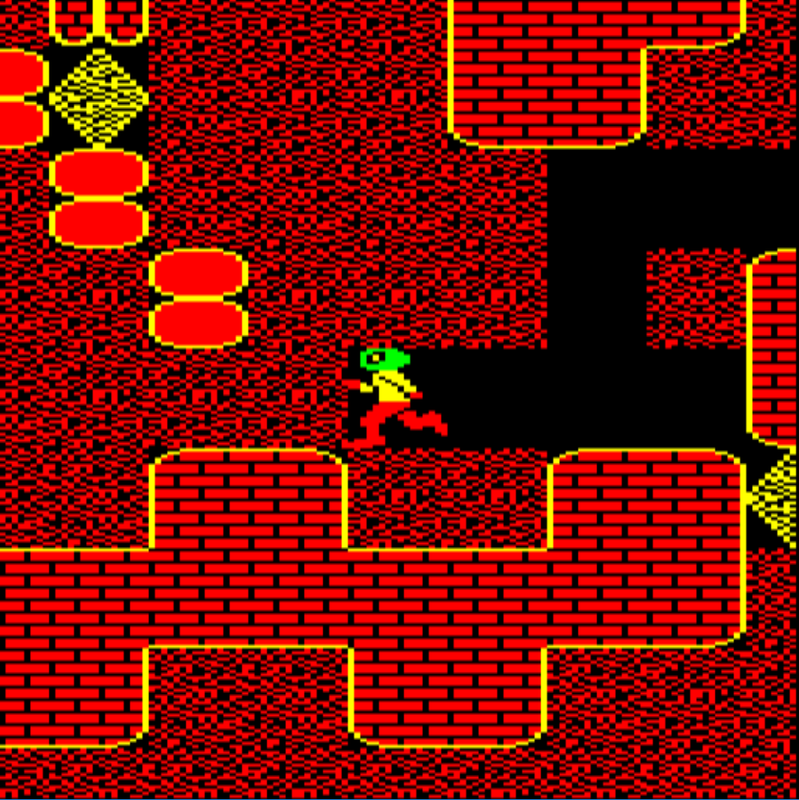 I've just bought Repton on Android. Getting chased about by three monsters "Giant Clam" on a touch screen without losing a life was very frustrating but the satisfaction when you achieve it is incredible. Well, I was also wondering how it would go but it seems to be doing fairly well. It's not any odder than some other games. It's a level type game with a certain amount of points to it, multiple ways to score those points to have a score climb higher, or not, and there are choices all along the way so it actually makes a very good choice for the challenge. I didn't think it would at first but by trying it, who knew?